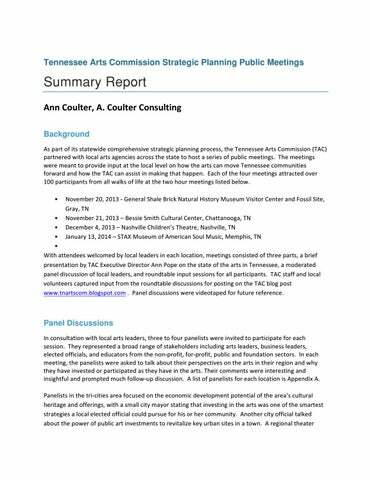 Background As	part	of	its	statewide	comprehensive	strategic	planning	process,	the	Tennessee	Arts	Commission	(TAC)	partnered	with	local	arts	agencies	across	the	state	to	host	a	series	of	public	meetings. The	meetings	were	meant	to	provide	input	at	the	local	level	on	how	the	arts	can	move	Tennessee	communities	forward	and	how	the	TAC	can	assist	in	making	that	happen. 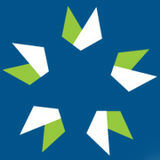 Each	of	the	four	meetings	attracted	over	100	participants	from	all	walks	of	life	at	the	two	hour	meetings	listed	below. • November	20,	2013	-	General	Shale	Brick	Natural	History	Museum	Visitor	Center	and	Fossil	Site,	Gray,	TN	• November	21,	2013	–	Bessie	Smith	Cultural	Center,	Chattanooga,	TN	• December	4,	2013	–	Nashville	Children’s	Theatre,	Nashville,	TN	• January	13,	2014	–	STAX	Museum	of	American	Soul	Music,	Memphis,	TN	• With	attendees	welcomed	by	local	leaders	in	each	location,	meetings	consisted	of	three	parts,	a	brief	presentation	by	TAC	Executive	Director	Ann	Pope	on	the	state	of	the	arts	in	Tennessee,	a	moderated	panel	discussion	of	local	leaders,	and	roundtable	input	sessions	for	all	participants. TAC	staff	and	local	volunteers	captured	input	from	the	roundtable	discussions	for	posting	on	the	TAC	blog	post	www.tnartscom.blogspot.com	. Panel	discussions	were	videotaped	for	future	reference.